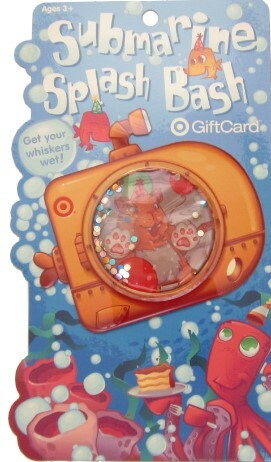 This week’s Submarine Splash Bash Wow Card is super cute! It features a kitty-cat in a submarine with a water and sparkle filled porthole- sort of like a flatter version of a snowglobe. 🙂 The backing for the gift card has a fun maze where you have to help the cat get to the Splash Bash party. And no party would be complete without a few goodies, 😉 so this card will come loaded with $50 on it for the winner to spend! My kids are crazy about sealife…this would he a great bday present. For my almost 3 year old! I am a devoted email subscriber. Love your site and love Target. This would be great to receive-thank you for the chance. My familybcould really use this! Good luck everyone!! Already “like” TT on FB! Thanks for the second chance! Already like TT on fb! Thanks for the great giveaways! You’re the best! What an adorable and wonderful giveaway! What a cute gift card! Would love to win it! Thanks for the chance!! I already liked TT on fbook! I use it often to find the best deals at Target! Cute kitty in a kinda snow globe! I love this site! Thank you!!! I already “like” Totally Target on facebook! I like Totally Target on FB. please pick me. thanks for another chance and an awesome site. I like Totally Target on Facebook! Great site! Thanks for the opportunity. WOULD LOVE TO WIN FOR WEDDING GIFT FOR NIECE. I already like Totally Target…great giveaway! WHAT A GREAT GIVE AWAY-BE NICE TO WIN SO PICK ME!!!!! I love that card – how cute! I like TT on FB…..thx for the giveaways!